Timeless and educational. Were these wolves concerned about the photographer? Absolutely stellar photographs! Keep up the good work. please, let me include them in my scientific paper. All in all, it comes down to the origin of the Europe-s wolf races, whereas the Arabian wolf, may have played a great part in it. Please, let me know if this is fine with you. Cheers. 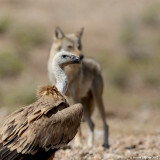 I saw a picture taken by you in 2008 - a close-up of vultures seemingly "attacking" a wolf. What was the context of that exceptional photograph? Although I know that the wolves and the vultures co-feed, in that picture it does seem like an old wolf and I was wondereing whether the vultures might have been waiting for it to die? Amazing gallery. I have no words to describe. Very good. V.
Remarkable gallery in every way. You have amassed some very exciting photos that are technically perfect. Vote.